Rokugan is a land divided. The seven honorable clans, Crab, Crane, Dragon, Phoenix, Lion, Scorpion, and Unicorn, each possess a territory in this diverse realm that is further split into provinces, one of which contains their growing city. Players must decide which clan they will represent in the coming war that will determine the fate of the realm, using that clan’s unique ability and special combat token to assert their dominance over the Empire that is to come. The ultimate objective of the daimyō is to become the most honorable leader in Rokugan by conquering provinces in the name of their clan. Players complete this task by placing control tokens in unclaimed provinces, battling rivals to expand their clan’s reach, and completing the secret objective tasked to each daimyō. Battle for Rokugan is played over the course of five rounds, each of which is divided into three phases. 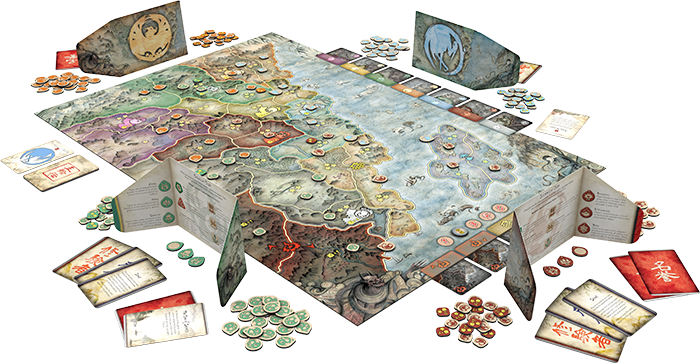 The first phase, upkeep, begins with the daimyō determining the first player by drawing from the initiative deck. Without the certainty of a routine progression, the daimyō must actively enact their strategies rather than biding their time. Next, each daimyō draws a hand of six combat tokens and takes the territory card of any area in which they control all provinces. Players may then form their strategies based on which territory card effects and token types they hold. A cunning daimyō may choose to trick an opponent by using a bluff token. With a touch of luck from the kami, an enemy will send their forces to one area and leave the true object of the combatant’s desire unprotected. In addition to the bluff, daimyō have six possible combat token types at their disposal. Armies can be used to either defend a player’s controlled province or to attack an adjacent province. Navies allow players to attack distant shores on any coastal border. The secretive shinobi can attack any province, regardless of distance. Apart from a direct attack, blessings can be placed on top of any combat token to defend it from card effects while still adding to the strength of a daimyō’s forces. If a player chooses to pursue peace, diplomacy tokens can be placed on any province a daimyō controls to bestow permanent peace and protect it from current and future attacks. As a last resort, a daimyō may raid a province and leave nothing but scorched earth behind. As the Rokugani daimyō struggle for control over the provinces, they must make military decisions during the placement phase to anticipate their enemy’s movements. Daimyō place the forces from their hand secretly, keeping their battle plans hidden from their opponents. Each daimyō has clan-specific abilities and forces to bring into the fray, and they call upon agile scouts and magic-wielding shugenja to bolster their strategies. However, these resources are limited daimyō must use them wisely. When utilizing these single-use cards, players select one enemy combat token. A scout allows the player to look at the token without revealing it to the other players, while the shugenja allow the player to not only reveal the token, but discard it from play. When laying their battle plans, daimyō must also account for any special tokens that populate the map. 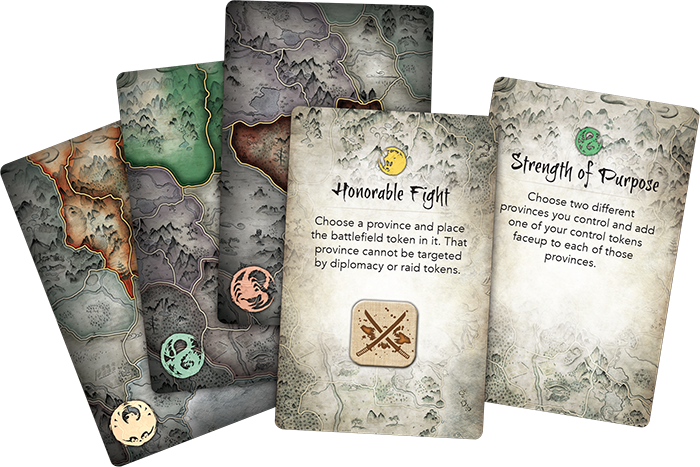 These effects, gained through territory cards, permanently alter the provinces of Rokugan. The use of a harbor token turns even a landlocked area into a coastal province, able to make naval attacks regardless of location. Peace and shrine tokens both prevent provinces from being attacked, but while peace also prevents that province from attacking an adjacent territory, a province that holds a shrine may still attack as they will. Battlefield marked tokens may never experience peace—daimyō cannot place diplomacy tokens here, but these provinces may never be raided. At the beginning of the resolution phase, all truths come to light as combat tokens are revealed. Any bluff or illegally placed tokens are removed out of hand, and then conflicts begin. First, any desperate daimyō who would rather destroy the land than have it fall into enemy hands may initiate their raids, leaving only scorched earth in their wake and permanently making a province incapable of being controlled or attacked by any clan. Once raids are completed, the rival daimyō may use diplomacy to settle claims. This discards all combat tokens along the border of two shared provinces and brings peace to the area, preventing the diplomatic province from both attacking and being attacked. If there can be no hope of peace, the daimyō must meet one another on the field of battle. All military engagements are resolved simultaneously, weighing the forces of involved provinces against one another. If the defending province wins the battle, they gain an extra clan token to further defend their claim from future attacks. But if the attacking nation overpowers a province, they assume control of the province and the defender’s hold on the realm weakens. If a daimyō fails their clan by losing all their provinces, they become ronin. These wandering warriors have no choice but to fight to regain their land and honor. They cannot raid or use diplomacy, but may only place armies on any land border until they reclaim a province. The Battle for Rokugan rages on for five rounds, at the end of which the daimyō will determine who has the most honor and is therefore most worthy of ruling the realm. Each faceup control token adds towards a daimyō’s honor with one point each, as do the honor stars within any provinces. Players also receive five honor points for each territory they control. Players also receive a bonus if they have completed their secret objective held since the beginning of the game. In the end, the most honorable daimyō will win the day. Strength, cunning, strategy, and wisdom shall pave your path to victory. Do you have the fortitude to lead the realm and bring honor to your clan? 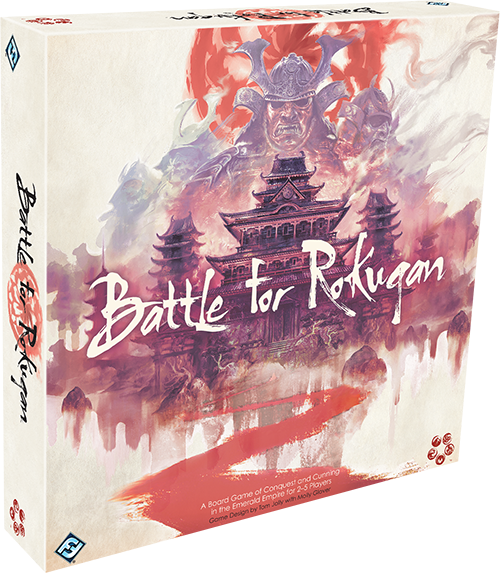 Lay your plans, make your conquest, and win the Battle for Rokugan!